There's a lot of good food hiding in this strip mall you drive by all the time. Too bad, because this mall also happens to sit smack in the middle of the local Filipino community’s unofficial restaurant row. Which explains why it houses a trio of nondescript but super-authentic Filipino food joints—two cafeteria-style turo-turo (“point-point”) restaurants and a bakery—serving everything from the standard chicken adobo to offal-laden noodle soup and banana-stuffed pastries. Definitely a cooler snack choice than the Yogurtland on the premises, and a worthy stop for adventurous eaters after a hard day of shopping for inkjet cartridges. The result is a soup as hearty and pungent as it sounds. Ilonggo’s got a rep for good batchoy, which is why the restaurant didn’t lose customers when batchoy-less turo-turo restaurant the Point-Point Joint moved in two doors down. Still, Dinulos is perhaps a little resentful of the competition. 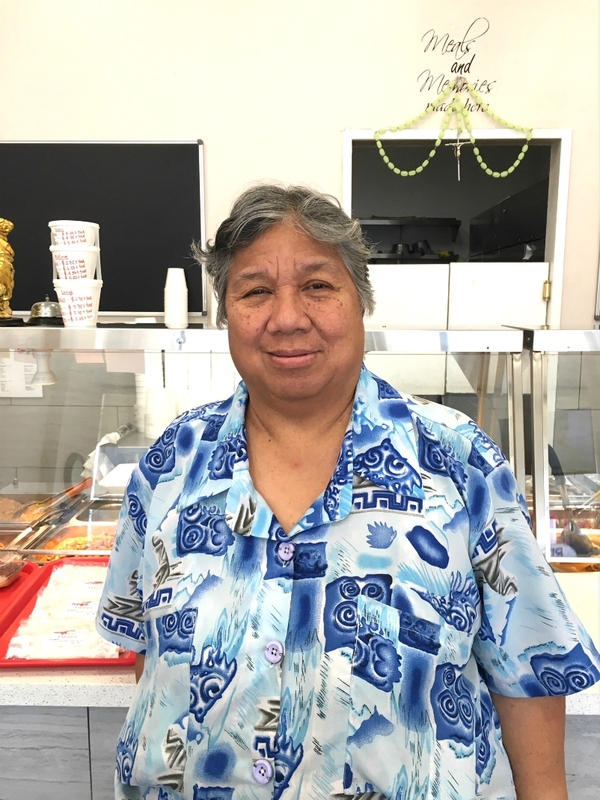 “When I opened the store here, the landlord said, ‘We will have no other Filipino restaurants in this mall.’ But I didn’t make sure that was in the contract!” She slapped her forehead for emphasis. I, for one, am thankful. While the Point-Point Joint shares Ilonggo’s spartan fast-food atmosphere, it’s got its own specialties. Like artichoke-esque banana blossoms, served shredded and marinated in vinegar. And fried pork cubes accompanied by a sate-like condiment made of soy sauce, peanut sauce, and pork liver. 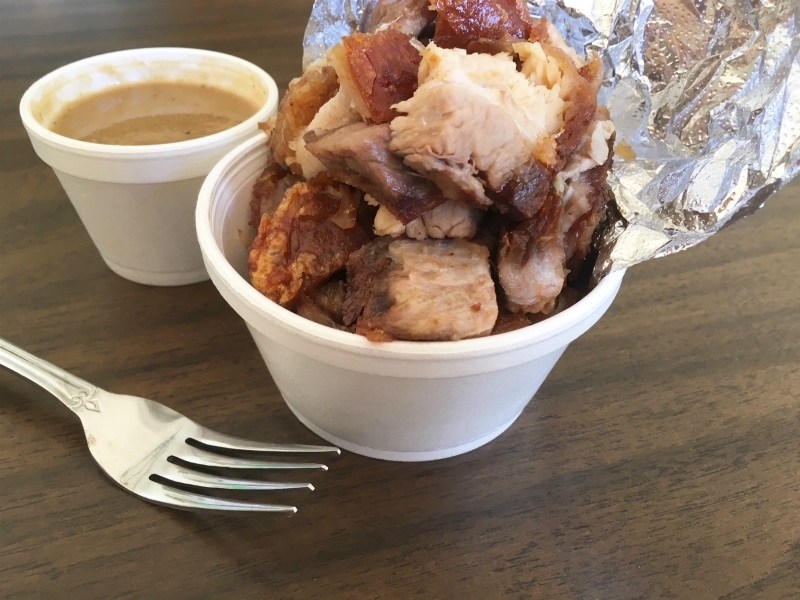 Speaking of pork, the Point-Point Joint offers a lechon service, whereby they will deliver to your home or event an entire barbecued pig. I wasn’t feeling quite that hungry, so JJ, the friendly guy behind the counter who suddenly had the exasperating job of explaining the whole menu to me, suggested I try some sushi bangus — tangy piles of shredded milkfish. While he scooped a heavy, grapefruit-sized dollop of it into a to-go container (this is no place for those who struggle with portion control), he said the Point-Point Joint has been at this location for something like 16 years. The high concentration of Filipino restaurants in the neighborhood draws customers from around the city, and between them and the workers from three nearby hospitals, business is decent. “The owners are buying houses,” he explained. At this point, walking back to my car, laden with two plastic bags filled alliteratively with batchoy, banana blossoms, and bangus, I definitely did not need any more food. That’s why Valerio’s Family Bakeshop is the devil. Sandwiched between Ilonggo and the Point-Point, its front window advertises an enticing variety of Filipino breads and pastries, and when they put out piping-hot loaves of pan de sal, it smells like fresh-baked utopia. You can’t possibly not eat there. 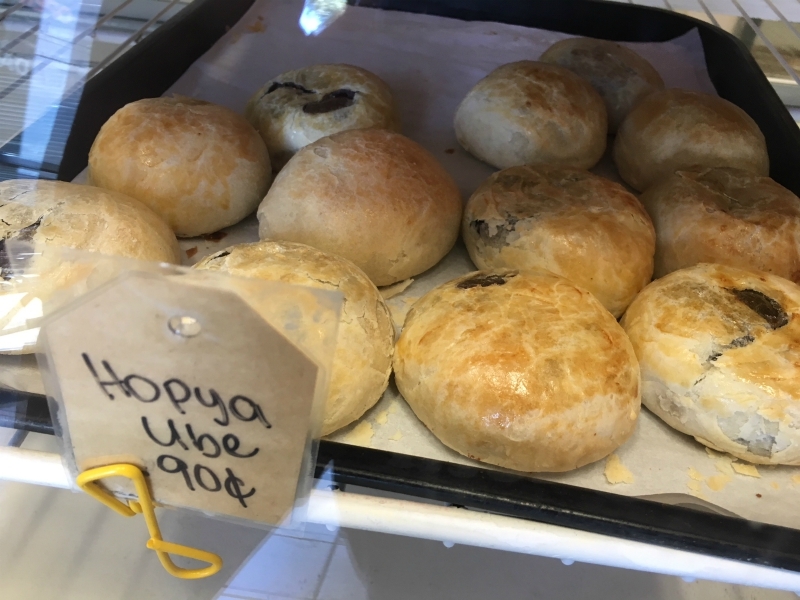 Luckily it’s cash-only, and I only had enough on hand to afford a single hopia ube — a densely doughy round pastry the size and weight of a hockey puck, marbled with sweet purple yam. I scarfed down the hopia on the drive home. 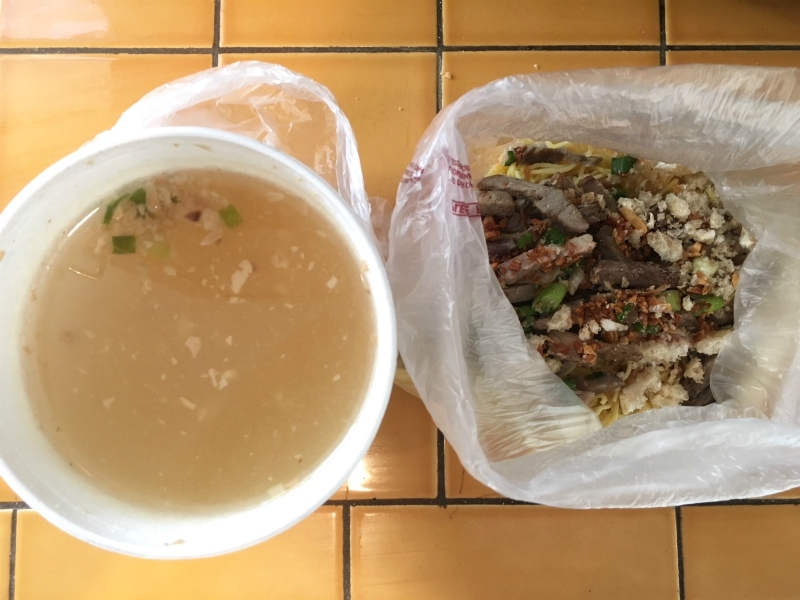 Then I ate about five big bites of bangus and rice, slurped down maybe half a cup of Ilonggo’s rich, starchy batchoy, and was immediately full for 18 hours. The next day, my kitchen was redolent of garlic from the leftover soup. 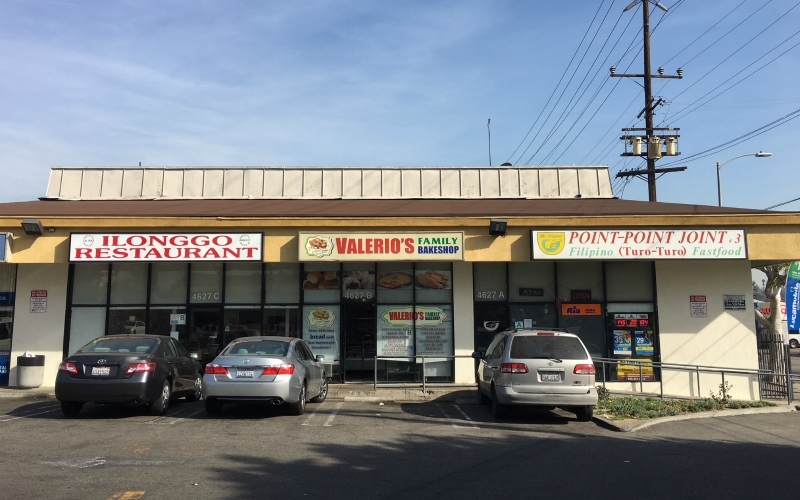 A trip to this strip mall lingers in your memory, stomach, and house. Parking Lot: Thanks to the presence of Staples, there’s ample parking and wide lanes. This alone puts it among the top five percent of all strip malls in Los Angeles. Dentist’s office? Yes, with Saturday hours. Specialty store of note: Kay Uniforms Los Angeles. Hipsters won’t find the Dickies work pants common to uniform stores, but if you’re planning to dress as a doctor for Halloween, this is your spot. Catering to local medical workers, Kay offers V-neck scrubs in just about every imaginable color and pattern. I swear I saw camo scrubs. While you’re there: Pick up some Asian groceries or seafood at Tambuli Market, which among many other things sells fresh milkfish, so you can make your own sushi bangus. The Point-Point Joint also offers a few shelves of Filipino goods and, handily, an American product called “Amazing Slim Tea.” You’ll need it to shed the weight you’ll gain after eating several hopias.